Becoming a mom is a life-changing event in innumerable ways. Through giving birth and raising a child, often a woman rediscovers who she is and what matters to her! With new beginnings come new opportunities. I am grateful that my daughter’s birth started me on the path of becoming a childbirth educator, which I absolutely love and am passionate about. However, before my pregnancy, I never would have considered it! This week, I met a remarkable lady who had a somewhat similar discovery. Michelle Hoyles was living near Portland when her first son was born. 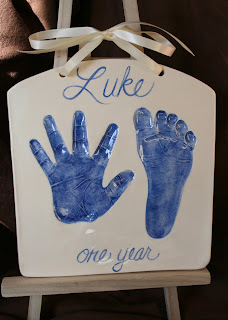 A friend gave her a gift certificate, as a shower gift, for a custom artwork of her baby’s handprint and footprint. After her son was born, Michelle had the artwork made and it become a cherished piece of their family history. Fast forward a few years. Michelle, now living in the Salt Lake area, had a second son. She wanted to have another piece of artwork made, this time with her second baby’s prints, so she could display them together. Michelle began looking for an artist to do the impression for her. However, she was frustrated in her search and couldn’t find anyone who offered the product she was looking for. As a former elementary school teacher with an art minor, Michelle saw this void as an opportunity. She decided to go back to Portland to train in this art method. When she came back, she continued to develop her technique and has since opened her own business, Impressions Clay Prints. Then, she masterfully takes the child’s prints (and if she could get a good print off my squirmy one-year-old, you know she has skill!). That’s all that’s required of you- just a few minutes. The impression then gets placed in the kiln. After that, it is hand-painted and glazed. 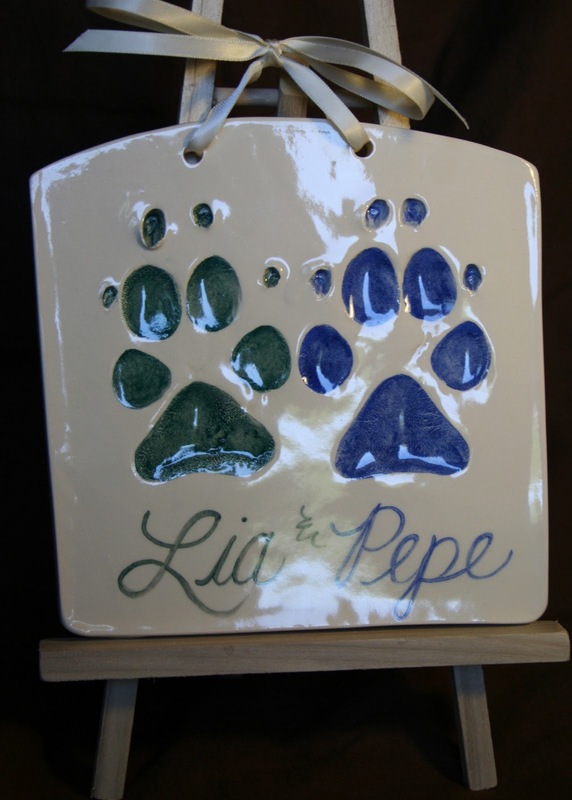 The process of hand-painting just the actual handprint or footprint (or paw-print) is what really makes the piece special. It highlights every line and really makes the piece attractive. Some other businesses (or do-it-yourself kits) will do a handprint or footprint, but they glaze the entire thing, so the print isn’t visible from far away. Also, the process Michelle uses will create a lasting keepsake, instead of a piece that will crumble away over time, like plaster does. To finish it off, Michelle paints the child’s (or animal’s) name and age, and adds a beautiful ribbon. 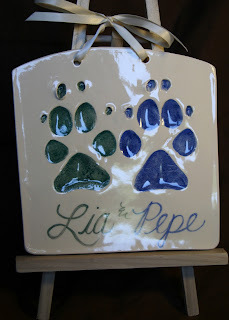 I love the idea of clay impressions, because it is a unique keepsake that both you and the child will treasure as time goes on. (And, unlike pictures, you don’t have to stress about your baby’s hairstyle or expression…or your remaining baby weight!). Some of the options in creating your artwork- size, color, etc. Visiting with Michelle was such a good reminder to me that motherhood is something to be treasured. We should treasure these moments, because before we know it, the little tiny baby we adored is a toddler…or teenager! Hopefully, in the midst of fully appreciating our children, motherhood will allow each of us the opportunity to do a bit of rediscovery and appreciate our passions and talents! How do you capture memories with your children? Photos, Artwork, Videos? What have you discovered about yourself since becoming a mother? P.S. To find out more about Michelle's work, visit her website at http://www.impressionsclayprints.com. You can schedule an appointment for you or plan a group event (parties, preschools, etc.). She also offers gift certificates! 3) Comment on this post, here on the blog, answering one (or both) of these questions above (in bold). -Make sure you put your name, as it is on Facebook, when you comment on the blog. -To comment, click at the bottom of the entry where it says "# comments" and it will open a comment box for you. My name is Alexei Jacqueline Johnson and I would love to win this gift certificate! My husband and I try to capture every moment with either pictures or video (and sometimes both simultaneously :). We definitely annoy friends and family with our constant need to document our little Maddox's life. We make photobooks using Shutterfly for all the holidays, and are currently making calendars for Christmas. For his first birthday two weeks ago, my husband made a 7- minute short film documenting his first year. From his first rollover and attempt at solid foods, to his first ma-ma, crawl and steps, this film is a precious reminder of how much our little man has changed our lives for the better. Becoming a mother has changed me in the most profound ways. I have learned patience, forgiveness, and selflessness. Most of all, I have discovered a kind of love that I never knew existed. A love that is so deep and consuming that I would do anything, sacrifice anything to ensure that my son is happy, healthy, and safe. My name is Kristie Thompson-Huffaker and my husband Kirk and I had our first baby in October. We are just in love with and in awe of little Jackson. We have documented his growth by taking pictures of him each day. Kirk saves them all in a file on his computer and groups them week by week. It has already been so fun to go back and see what he looked like and what he was doing at birth, week 1, week 2, etc. Kirk also posts all of the pictures to our flicker page so that all of our family members can look at them. He was a much awaited baby and his grandparents, great grandparents, and aunts and uncles were all so excited about him and like to keep up with the latest developments. We would love to win the gift certificate so we could put it towards making a Christmas ornament for each of his grandparents, and great grandparents...and one for us too! Jackson has already taught us so many things about ourselves. I have discovered a love and joy that is greater than I ever imagined. I have also developed a great appreciation of the simple things in life such as a soft breath, a smile, a snuggle, a little sneeze, as well as a shower and 3 hours of uninterrupted sleep. Being a mom is the most important and fulfilling thing I have ever done! My name is ApolloKristy Moser. I try to keep a journal...really just notes on google calendar about milestones. I really just try to live in the moment to play with my children. When I am playing with them I try to be there all the way, not multi tasking. I have learned I don't have the patience I thought I did, and I always have something to learn. Thank you for this opportunity, even if I don't win I am glad I have learned about Impressions Clay Prints. Hey All. Kimberly Yost here. With our kid we do the usual pictures, videos, and blogging. But on top of that, my husband set up a gmail account for our son and has periodically sent him emails. He writes about the fun/funny things Eli does, how much he loves him, how proud of him he is, etc. One day, when Eli needs an email account, we will give him access to it and it will be full of wonderful memories from dad. For me, since our son is just starting to talk (and say the funniest things) I create a twitter profile for him and will post the little sayings he says throughout the week. I think it will be a fun way to reflect on the every day life of our son as he grows up.